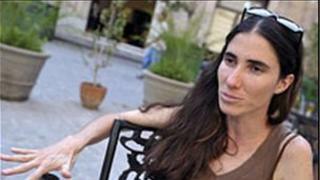 Cuban dissident blogger Yoani Sanchez says she has again been denied permission to leave Cuba. Ms Sanchez said it was the 19th time the government had turned down her request to be allowed to travel abroad. Ms Sanchez writes a popular blog with a wide international following in which she is often very critical of the Communist authorities in Cuba. She had been granted a visa to Brazil, which had raised her hopes the Cuban government would allow her to travel. "There are no surprises," Ms Sanchez tweeted. "It is occasion number 19 in which they have violated my right to enter and leave the country," she wrote. The Brazilian government issued a visa to Ms Sanchez in January to allow her to visit Brazil for the premiere of a documentary about media freedom in Cuba. Cuban dissidents had hoped the move would put pressure on the Cuban authorities to allow Ms Sanchez to travel abroad. Cubans must obtain the government's permission to leave the country and have to go through an elaborate process to get it. In 2009, Ms Sanchez was denied an exit visa to travel to New York to receive a top journalism prize for her Generacion Y blog..
Ms Sanchez and her blog have been given international recognition for highlighting issues affecting young Cubans on the communist-run island.